LSU Fans say GO Tigers GO! This is a mighty big bow for all our mighty big Tiger fans. Triple layered bow of purple and yellow gold grosgrain topped with a satin LSU ribbon. Dress your little girl up for the big game and head out in style with this big bow. 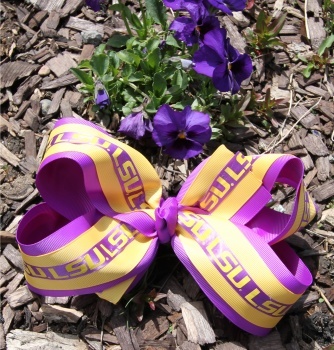 It will look great with her cheer outfit or any LSU Spirit shirt to show our support for our LSU Tigers.